Junior guard Mei-Lyn Bautista looks around a Rhode Island defender during a women's basketball game last week. Before the season began, women’s basketball head coach Jennifer Rizzotti said her team would need to “redefine” its style. Rizzotti had hoped a small roster with a number of young players in the rotation would mesh well with her more comfortable coaching style in her second year at the helm and lead the team to repeat the program’s recent success. But GW’s changes have prompted an up-and-down season. Although Rizzotti’s squad has picked up recent victories over Davidson and Rhode Island in January, the team is 9-11 on the year and 4-4 in the Atlantic 10. With eight contests remaining, the Colonials have already lost more conference games than they have in the last three years. Amid the rocky season, GW has relied on its upperclassmen to fuel the offense and help the young team during difficult stretches. Against Saint Louis Sunday, the Colonials were led by Cummings – who scored 20 points and dished out six assists – and fellow veteran players senior forward Kelli Prange and junior guard Mei-Lyn Bautista, who both scored 15 points. Cummings and Bautista hit late-game shots this weekend that kept GW in the game before the team ultimately fell 72–69 on a buzzer-beating three. Prange’s performance was her fourth consecutive double-digit scoring outing, including a career-high 36 points last week, after missing seven games in December and January due to a concussion. She earned Atlantic 10 Player of the Week honors after her recent performances, the league announced Monday. “We’ve talked all along about waiting until Kelli came back and how that would give us an extra scoring presence,” Rizzotti said. Since Prange returned, no freshman or sophomore players have scored more than five points in a game. The Colonials’ total offense in conference play has dipped to 58.5 points per game – the third lowest total in the A-10. Still, a combined 13 individual upperclassmen performances of 10 points or more during that five-game stretch has kept GW around the middle of the conference’s standings. Cummings, who leads the team with 14.7 points per game, has taken a split role of go-to scorer and one of the Colonials’ main distributors. Three of her four 20-point performances have come over the past six games, including a career-high 28 points in a victory over George Mason Jan. 7. 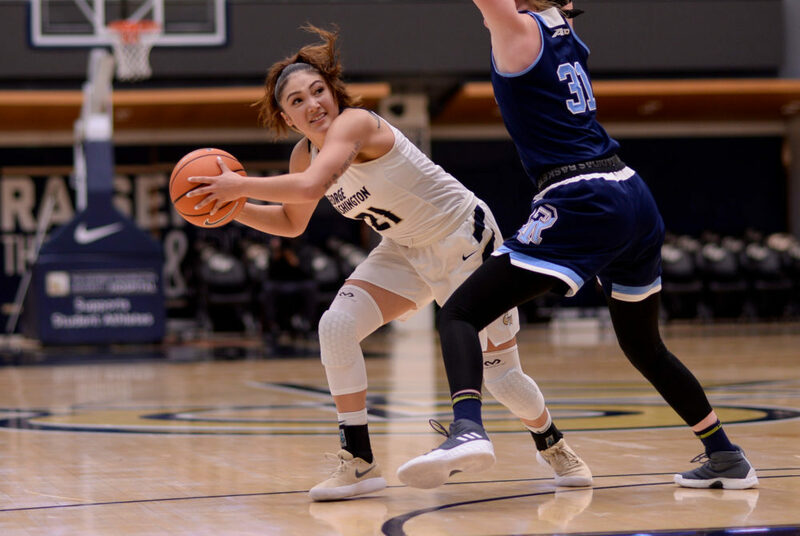 With a short bench and three impact freshman, GW has benefitted from the emerging scoring presence of junior forward Kelsi Mahoney – who is averaging a career-best 8.5 points, while shooting 35 percent from beyond the arc. Her shooting ability has extended their defense in a majority of the team’s games. Mahoney was especially important in matchups against American and VCU. She fueled the team’s scoring push with a combined 32 points with Prange on the bench. With Mahoney and Prange both playing sizable minutes in the frontcourt, alongside freshman forward Neila Luma, the Colonials often play with a good amount of size on the floor – but haven’t been able to compete on the boards. GW averages 32.2 rebounds per game – 6.2 less than its opponents – and only won the battle on the glass just three times all year. The difficulty on the interior is a new problem for a Colonials program that averaged 42.6 boards per game last year and has graduated two of the A-10s top forwards in the past two years. With losses in narrow battles against Syracuse in November and South Florida in December, and wire-to-wire games against top conference foes like Duquesne and Saint Louis in January, the Colonials record is likely to improve by season’s end. Players said they feel the team is still poised for a formidable end to the season. “I think there is no stopping what we can do,” Bautista said. The Colonials return to action for their third consecutive home game Thursday at 7 p.m. against La Salle (7-14, 2-6 A-10).